Westmead Hospital’s radiation therapists Alison Brown, Hanh Vu and Emma Jones. Western Sydney cancer centres celebrated World Cancer Day with the unveiling of 1,000 paper cranes. The cranes are now hanging from the ceilings of the radiation oncology waiting rooms at Westmead and Blacktown hospitals. Radiation therapist Alison Brown organised the meticulous folding of the multi-coloured cranes by staff and patients. “Today symbolises hope and healing during challenging times,” Ms Brown said. 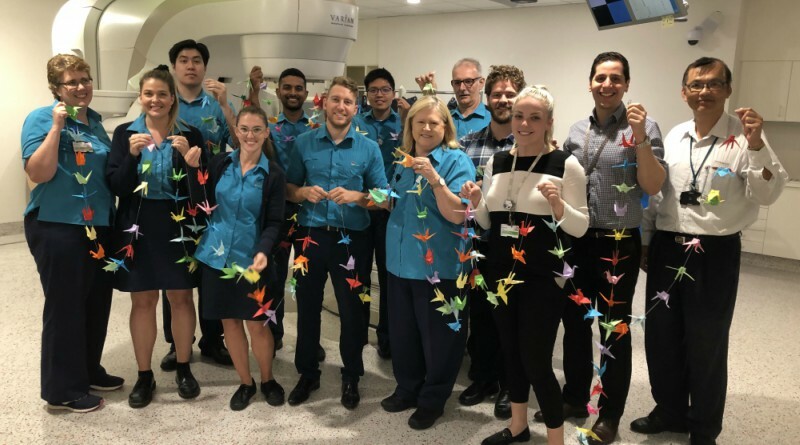 Blacktown Cancer and Haematalogy Centre patients and staff hand-crafted 1,000 paper cranes. Westmead Hospital’s radiation oncologist Associate Professor Sandra Turner said World Cancer Day is an opportunity to celebrate the vital role of radiation therapy. Professor Turner is part of a volunteer radiation therapy team including doctors, therapist, nurses and physicists who run the Targeting Cancer campaign to raise awareness of radiation therapy in the community. “Radiation therapy is used for nearly all types of cancer,” Professor Turner said. “Forty per cent of cancer cures involve radiation therapy. “As well as curing cancer radiation is very therapy is very helpful in relieving symptoms to help improve patients’ quality of life.